On October 24, mtvU, MTV's college-oriented network, aired the first installment of a four-part reality mini-series, Quiet Campus, focusing on four Gallaudet University students from diverse backgrounds: Taylor Oliveira, Clayton Lawson, Cesar Ayala, and Michel Dazé. There was considerable disagreement over the appropriateness of the title, as it's common knowledge that Kendall Green can be quite noisy, especially at night. 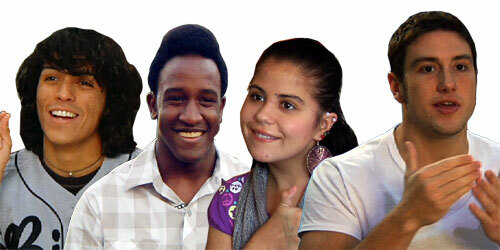 Aside from that, viewers applauded the upbeat tone of the series, in which the students are shown going about their lives on campus, and also talking about their backgrounds, their Deaf identities, and how it feels to grow up deaf in hearing families, be Deaf in Hearing society, and thriving in an ASL-based environment. Taylor Oliveira attended Horace Mann School and Boston Arts Academy, and is majoring in Early Childhood Education and minoring in Dance. Cesar Ayala is from Palm Springs and an alumnus of California School for the Deaf, Riverside. He's considering in-depth studies in Photography, but is also considering counseling, possibly working at a school for the deaf. He is proud of his identity as a Deaf Gay Latino, and wants to "help young gay kids who went through bullying." Clayton Lawson is from a "strongly-rooted" Jamaican family. He wants to earn a doctorate in Psychology and minor in Recreation. Michel Dazé is an alumnus of Maryland School for the Deaf, Frederick. He's been playing offensive line on the Bison varsity-football squad. The GU community received the casting call (an announcement about the screening interviews) through the campus E-mail newsletter, the Daily Digest. Cesar decided against going to the interviews, but his friends persuaded him to go—and he realized that he could use the opportunity to show his family what Deaf culture was about—a side of his life that they had never really seen. Clayton "always wanted to make a difference in the world." Taylor took the intrusion of the videocamera as a learning experience, and noted that the glow of celebrity boosted her social life, as fellow students who hadn't approached her before came over to chat. Executive Producer Paul Ricci told us, "Our mission from the outset was to show how diverse, intelligent, and charismatic these students are, and to illustrate how similar they are to hearing students . . . I don't think the hearing audience is properly educated." These students don't want to be labeled "hearing-impaired" or any other of the klutzy euphemisms floating around. Being deaf is a prized part of their identities, and a source of pride. Hopefully, uneducated viewers saw . . . and understood.